Excalibur is probably the most famous named sword in fiction. If a culture ever used swords in warfare chances are there’s at least one named one. In Japan you might hear of Kusanagi, which is their nearest equivalent blade. Siegfried & Hagen carried Balmung. Joyeuse was wielded by Charlemagne, Duradal by his knight Roland. Orcrist found it’s way to Thorin Oakenshield after having been held by an elven king. A nameless long dagger was given the name Sting & grievously wounded one of the horrors of the third age. In more modern works Dark Sister, Heart’s Bane, Longclaw, Oathkeeper, Red Rain, & others spring from the pen of George R.R. Martin. The most legendary sword in Game Of Thrones is Lightbringer, who was forged by the hero of light Azor Ahai, who plunged it into the breast of his love Nissa Nissa causing her soul to bind to it & become the only weapon capable of defeating the great other. On a smaller scale by naming a weapon you can speak to it in times of stress to calm yourself & give yourself a rush of adrenalin. Even when you’re alone you can simulate a relationship with an object to embolden yourself. In fiction the power granted is much more literal. Fell outta muh chair, laughing! THIS SWORD OF MINE BURNS WITH AN AWESOME POWER! MY LOVE! MY ANGER! AND ALL OF MY SORROW!! BEWARE MY POWER, ARVANDOR’S LIGHT! I Have the POWERRR! Oh, and by the way, in the name of the Moon, I punish you. Jus’ sayin’. Honestly, with that kind of RP, I’d be inclined, as a DM, to give a special one-shot “save against failure”, or something like this. Because it improves the whole session, and because the alternative would be, probably, a total party wipe. Of course, one could also let the die decide, and teach the lesson that fate is a harsh mistress, but I’m not sure it would be best with begginers. On a scale of 3-18 (3d-6) i see by your stats you rolled a 21 for compassion. For that kind of awesomeness? +12 to hit, triple max damage, +6 bonus to party morale, at the very least. Heck even if her character is not a Paladin I would have at least one god grant her a maximized smite evil. There would of course be the associated momentary holy glow to the sword as it cleaves through the undead abomination that is now emitting an otherworldly scream despite being rent in twain from stem to stern. Okay this is my first time commenting like ever since I started reading some years ago but I just had to say that Jo has always been my fave and this scene made me very gay. i too, am easily wooed by ladies with swords. Waifu Jo is tres cute, but for epic awsomeness ripped Jo takes the cake. Takes the Cake, the icing, the plate, candles, prezzies, and whatever humans she wants to take. Give them to her, all her desires!! Because: Jo! Somehow- the talk about named-weapons reminded me about “Big Baby”, from the Hellboy 2 film. Big Baby is a HUGE, revolver looking shotgun, with 6 chambers. Each bullet/cartridge is as big as your fist. Hellboy seems to play a music box, (that is also on BB), before firing it. I don’t know if Big Baby [needs] this music, for magical needs, or for emotional needs. [ The HB films are kind of a weird world, in my opinion]. Or maybe, Big baby doesn’t need this music at all? The film didn’t say. It *was* Donald Sutherland, but it was in the Clint Eastwood WWII movie, “Kelly’s Heroes”. That’s true. Good old 1970s films. But, I can see how people can mix up those two guys. 2) stay here, and listen to that, darn-AWFUL, squeaky-toy-soundin’, ear-pounding music. I mean, which one would [you] choose? [ My apologies to all the bagpipe lovers, and to all Scottish people, out there]. Aw heck- I was just joking about bagpipes. BPs are one of the main reasons I go to Highland Games, when they appear around my town. Hey now – save some of that love for the Greeks and Cretans since they have their own version of a bagpipe. Mind you theirs is a wee goat instead of a wee sheep but the effect is the same. Cradle it in your arms with feet up in the air, you hands wrapped around its neck while biting on its tail. Hey, I love the bagpipes. I love them from afar. Very, very far. I used to have a bagpipes cassette tape. Yes, cassettes were a real thing, back in the old days. Honestly, all bagpipe tunes, if “tune” even applies, sound like “Garry Owen” to me. I am of Scottish descent (MacLeod), and no more insane than your average Scot. THE FEELS! THEY’RE OVER 9000!!! she is holding it – talking to it. not holding it – swinging it, right now. grip shifts occur as blade swings occur. grip is determined by desired outcome. She is of elven heritage so that is a long-sword with which she would get her racial bonus to hit with it. One handed martial weapon swung two handed gets a +50% to her strength bonus. Goddess favour grants a smite – maximized sine she really likes that prayer. I squeeed so hard I went gay for like 12 seconds. Don’t forget Elric’s black soul-drinking sword Stormbringer. I’ll give a shout out to Hrunting, Beowulf’s sword. For some reason I feel like dropping my favorite named sword from my own dnd games. 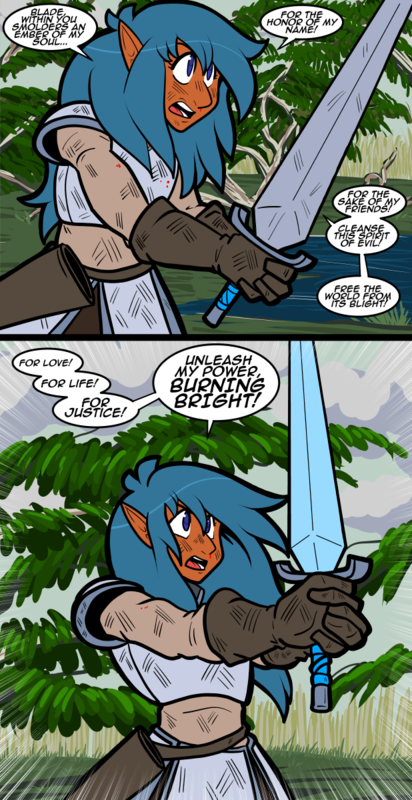 Shadowflash an elven dueling-sword, carried by a vigilante hero. Total> 8-18! At minimum, that’s a Stagger. It’s safe to assume 16-18 is a Critical Hit, and that’s before any Magical Effects are applied. Go Jo! It’s Nice to see Jo’s image of her character looks like she could actually wield that sword. The best description that I have read of a sword fight is from Phil Foglio’s What’s New Column: [Paraphrased] Hold 2 dictionaries at arms length, in front of you, and SLAM them together, rapidly, as hard as you can, for 20 minutes. That chat is sounding very Lantern Corps Oath like. I heard a lot of things as I read Joe’s speech to her sword. Green lantern, my little pony, and quite a bit more. But more prominently then anything else, and I don’t know why, I heard Shining Finger.